By Petride Mudoola: Robert Sebunya, who is serving a 45-year jail term for murder in Luzira Maximum Prison, is HIV-positive. His life in jail has been one hell of a nightmare. “Its double tragedy living positively behind bars,” he says. Sebunya is in bad shape and is required to use Antiretroviral (ARVS) drugs which he is able to get but finds it difficult to take. “I cannot swallow them on an empty stomach. I end up throwing them away,” he says. For a man whose state of health requires constant and proper feeding, Sebunya is in danger of experiencing more serious complications. He says that even though inmates receive the required medication, there is need for authorities to consider supplementary diet for HIVpositive inmates. The prisons lack the necessary nutrition to cater for HIV-positive inmates, yet those on ARVs are meant to take a balanced diet. Gabriel Mugaga, another inmate living with HIV, says many of his colleagues fear to take ARVs due to the bad feeding in the prison. “We throw away the ARVs because we cannot swallow them on empty stomachs.” Mugaga wishes to have healthy meals from his family in Kibaale, but they are far away and cannot bring food for him. Poor feeding is one of the major challenges that HIVpositive prisoners in Uganda face. This has made the already appalling conditions of HIVpositive prisoners even worse. Frank Baine, the prison’s publicist, observes that while the prison is supposed to cater for HIV-positive inmates, its budget is too small to do. Baine says as a prerequisite, prisoners are subjected to an HIV test upon being imprisoned. Those found to be positive are referred to the inmate’s health facility for treatment and restricted from engaging in hard labour. But there is little support in curbing the spread of the virus among the inmates, he adds. 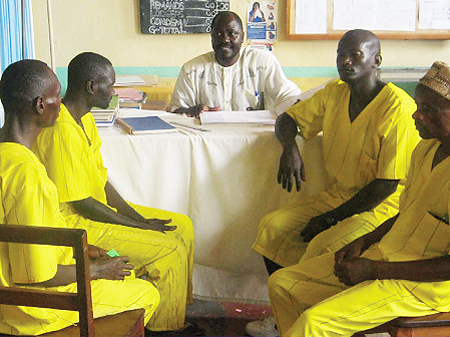 The HIV prevalence among inmates has also been heightened by the increased sharing of sharp objects among prisoners. According to the prisons department, Uganda’s prisons has over 2,000 HIV-positive prisoners. Three hundred and fifty inmates living with HIV are in Luzira Maximum Security Prison. Only 178 of them have access to ARVs on a regular basis. During celebrations to mark World AIDS Day at Luzira Prison, Dr. Joseph Andama, the medical superintendent Murchison Bay Hospital, said HIV prevalence among inmates was higher than the national average. He urged the Government to invest in the management of HIV/AIDS and Tuberculosis (TB) in prisons to reduce more infections. “This investment should consider timely diagnosis, early treatment, observing the dosage strategy, ensuring that HIV inmates are screened for TB and those with latent TB receive isoniazid treatment so that they don’t develop fullblown TB,”Andama explained. Andama said prisoners’ misuse of sharp objects has worsened the situation. And due to shortage of counsellors, many inmates find it hard to cope with their condition. Johnson Wavamuno, an inmate in charge of prisoners living with HIV in Luzira Upper Prison, says the limited number of counsellors due to understaffing leaves inmates unable to deal with the consequences of HIV. He says more trained counsellors should be attached to the detention facility. According to AVERT-An international HIV/AIDS charity, the number of people living with HIV globally rose from around eight million in 1990 to 34 million by 2010. The World Health Organisation (WHO) statistics for 2010 corroborate this figure. WHO adds that 17% of people living with HIV by 2010 were women. Since the beginning of the epidemic, nearly 30 million people have died from AIDS-related causes. In 2010 there were an estimated 23 million people living with HIV in Sub- Saharan Africa. This has increased since 2009, when an estimated 23 million people were living with HIV, including 2.3 million children. In Uganda, incidence rates have stalled at 6.4%. According to the Uganda AIDS Commission (UAC), close to 128,980 people acquired HIV/AIDS last year up from 124,261 in 2009. UAC estimates that 64,016 people die in Uganda from HIV/AIDS per year.